What makes a little boy feel grown-up? Dressing up like his Daddy, of course. Daddy’s Dastar captures a moment between a father who cherishes his little boy and a son who can’t wait to grow up. Tegh pleads with his father to let him wear one of his colorful dastars. Although his father insists that Tegh is far too young to wear one yet, Tegh convinces him otherwise. For after all, Tegh won’t be a little boy forever. Daddy’s Dastar is also an introduction to Sikh culture and a celebration of its most cherished ceremonies. Inni Kaur is the author of Journey with the Gurus; Sakhi-Time with Nani ji and Thank You, Vahiguru. All the illustrations of this project are done and raising funds to print 3000 copies. SikhRI is requesting the DVN community to help us raise $10,000 to cover the printing cost. All funds raised will be utilized only for this project. 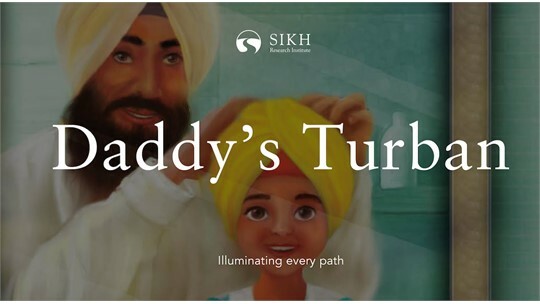 Sikh Research Institute is delighted to announce the release of its new bilingual book for children: Daddy’s Turban. The book was written by Inni Kaur, meticulously edited by Gurdit Singh, poetically translated by Harminder Singh, and gracefully illustrated by Anantdip Kaur. Representing the third children’s book in SikhRI’s collection — preceded by My Gurmukhi Khajana and Thank You, Vahiguru — Daddy’s Turban is the result of tremendous effort and explores the significance of dastar (turban) through the connection between father and son. The book depicts the fascination of a little boy, Tegh, with the way his father wears his dastar. Tegh wants to grow up faster, while his father cherishes the naiveté of his son. Between the lines, this is a story of Sikh culture and a celebration of its most cherished ceremonies. 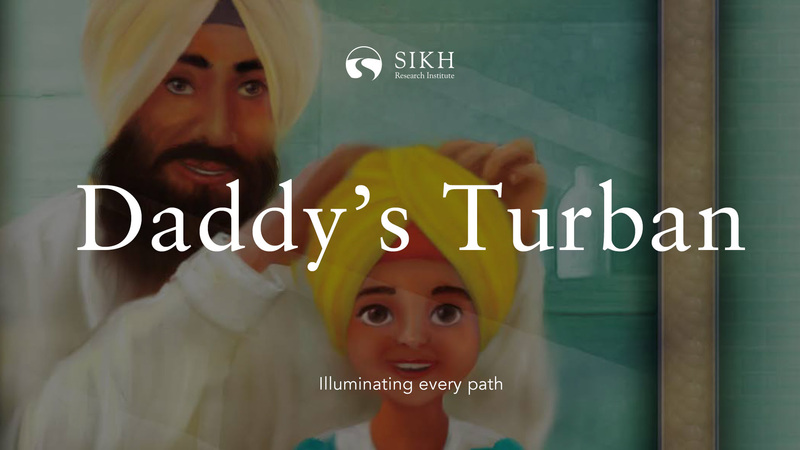 Daddy’s Turban is a bilingual book, combining both English and Panjabi in equal measure, thus making it more accessible to a wider audience of the diaspora. The book is targeted at boys and girls, ranging from 4 to 10 years old, as well as their parents and grandparents. Educators will also find the book helpful in their teaching, as it contains a special essay The Significance of Dastar Bandi written by Rubin Paul Singh which explains the deeper reasons behind wearing a dastar. Daddy’s Turban will become available in November for $18.95 through the SikhRI store, with the Kindle edition following at a later date. To celebrate the gurpurab of Guru Nanak Sahib, all SikhRI books in November will be offered at 20% off. For any questions regarding Daddy’s Turban or other SikhRI books, please contact Nicholas Singh at nicholas.singh@sikhri.org. Please consider making a donation to help Daddy's Dastar: Bilingual Picture Book reach its goal. A donation of any amount goes a long way to support the work being done. Thank you for empowering and fueling the work of the Sikh sangat!